On the eve of the playoffs, I take a look at the most improbable game of the 2014-15 NBA regular season. Earlier this year, I rolled out an improved version of my NBA win probability model. The new model resulted in better predictive accuracy in out of sample testing. It also reduced the number of "impossible" comebacks. Prior to the upgrade, there were several games in which a team with a win probability of zero ultimately came back to win the game. This would indicate an overconfident model. After the new model was rolled out, most of those "impossible" comebacks were downgraded to merely "improbable". Except for one. On November 13, the Memphis Grizzlies trailed the Sacramento Kings by one point, with six seconds left in regulation. With two seconds left, the Grizzlies' Zach Randolph missed a 7 foot shot that would have given Memphis the lead. The Kings' Ben McLemore pulled down the rebound with 0.9 seconds left in the game. At this point, the Kings have the lead, possession, and just nine tenths of second left on the clock. My win probability model pronounced the Grizzlies dead. Odds of winning: 0%. McLemore is immediately fouled, but not before 0.3 more seconds tick off the clock. But McLemore misses both free throws and Randolph gets the rebound off the second miss. An additional 0.3 seconds bleed off the clock, but the Grizzlies have a pulse: they have the ball, and 0.3 seconds of game time to do something with it. Their win probability rises, zombie-like, to 5%. This game was stupid-ridiculous. 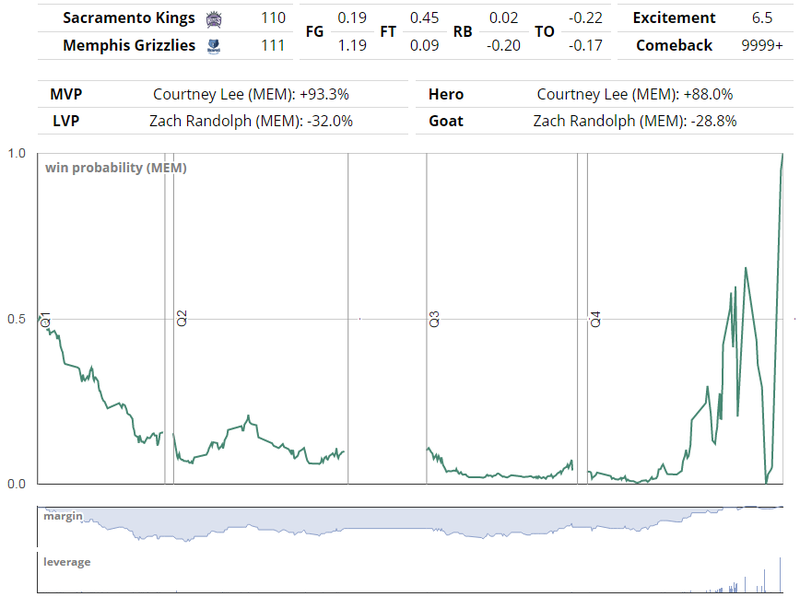 The Grizzlies trailed by 26 points early in the second quarter (win probability 6.9%). The deficit was 20 points late in the third (win probability: 1.9%). And with 7:37 left in the fourth quarter, the Grizzlies were behind by 18. Their win probability was a barely finite 0.4%. You can use the Top Games Finder to find other improbable comebacks for any game over the past four seasons. Filter by team, date, and regular season vs. playoffs.